Starting out in what was, at that time, the trio of drummer Brian Downey, guitarist Eric Bell and of course songwriter/vocalist/bassist, the dearly departed Phil Lynott, Thin Lizzy’s quite heavy “Look What the Wind Just Blew In” begins disk one of Thin Lizzy: At the BBC. “Whiskey in the Jar” comes next, from a 1972 John Peel radio session (there’s a good amount of John Peel stuff here) and is the quintessential solid riff and strong Lynott vocal. It’s not surprising as this is one of TL’s early hits, with Bell especially outfitting himself perfectly. “Things Ain’t Working Out Down at the Farm” is the first of the live cuts here and is another great example of Lynott’s vocal swagger and the trio’s tightness. I love the low rolling toms and Lynott’s bass in seething story-song “Vagabond of the Western World” from a 1973 John Peel session, a good early example of backing vocals from the band. “The Rocker” is a loud jangly rocker with a truly truckin’ Lynott riff. This is really, for me, the first sparkling great on disk one. “Black Boys on the Corner” snaps with menace, from a ‘74 Peel session with a chunkin’ “It’s Only Money,” from the same session ending this first CD. The blistering “Sha La La” is on disk two, with John Peel stuff from ‘74. There’s a whole bunch of in-concert stuff here from 1974 with the ballad “Still In Love With You,” a true Lynott love song gem. Back to in-studio stuff like “Rosalie,” a tight darker-then-it-is-on-the-record “Jailbreak” and “Cowboy Song” (my personal Lizzy favorite) showcasing how tight bands of the 70’s were when they played these live, stressful radio performances. This second disk ends with a bunch of stuff from a 1981 Lizzy appearance at England’s Hammersmith Odeon, featuring “Renegade” and “Killer on the Loose” as well as “Cold Sweat” and the shunk-shunk-shunk of “The Boys Are Back In Town,” both from the Regal Theatre in 1983. 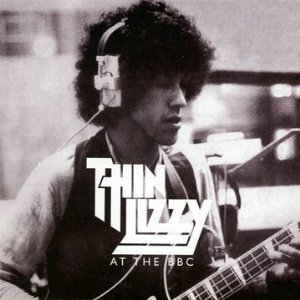 Though the BBC was notorious for wiping tapes of their shows, somebody did us a service trolling the archives and also asking for contributions by fans for these wonderful two disks worth of Thin Lizzy: At the BBC.